Hello, lovelies~ If you are located in Indonesia, you probably have heard about the latest acne-fighting product from POND'S. It is a line targeted for teens that currently deals with acne or blemishes because it claims to reduce the appearance of acne. I bought the concealer a while ago at Watson's Kelapa Gading just out of curiousity. Here is what I think of it. The concealer pen retails at around Rp 25,000-Rp 30,000, depends on where you buy it. I can't really remember how much I bought it for, but it was not more than Rp 50,000. I was honestly surprised when I saw the price because it is affordable. The ingredients are listed on the back of the carton with Isocetyl Myristate and Isopropyl Myristate dominating on the top position. This may cause acne to some individuals, according to the this source. 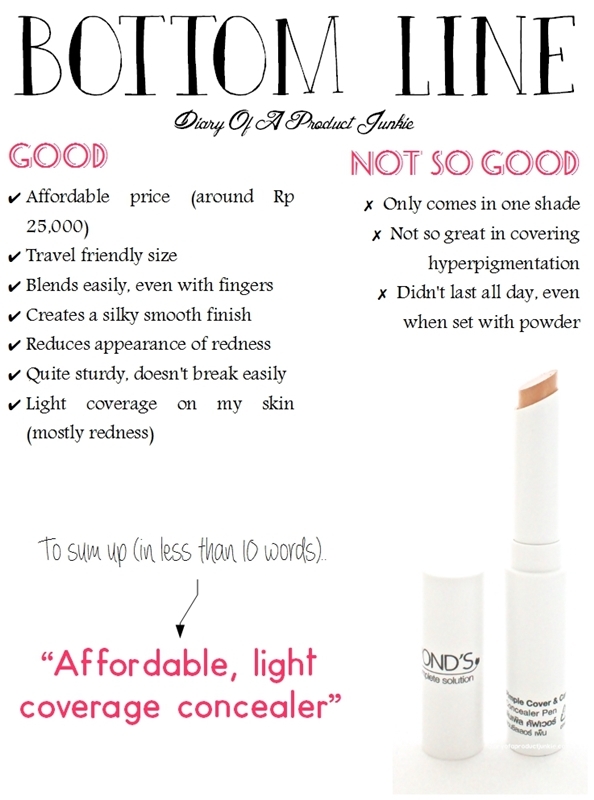 It depends on the person's skin, so please disregard this if you have no problems with this concealer. I have yet to try the pH level of this concealer, so I don't know if the salicylic acid is at the right pH for it to be able to work and treat the acne. Well, hopefully it is. Dimethicone and silica are included to make blending easier and a silkier finish. As for the size of the concealer pen, it is small and easy to carry around in almost every makeup bag there is known to man. The product is packed in a creamy stick form, so it can be easily 'drawn' on any imperfections to make it disappear for a while. Sadly, there is only one shade in the market for this concealer, so there isn't much to choose from. However, I find that it blends well on my light-medium skin. The concealer has a light coverage on my skin, able to minimize the appearance of redness on my cheeks. As for my blemishes, I feel that I need to blend it carefully around the edges if I want a to achieve medium coverage because it blends really easily that it can 'slip' and not cover the blemish if I blend too hard. It doesn't really last all day long, possibly because of the very creamy texture on the skin. Setting it with a powder is a must for me to help keep it on my skin. Overall, I think that this would be a good concealer for those who encounters redness on the face, given that you are not allergic to any of the ingredients in it. 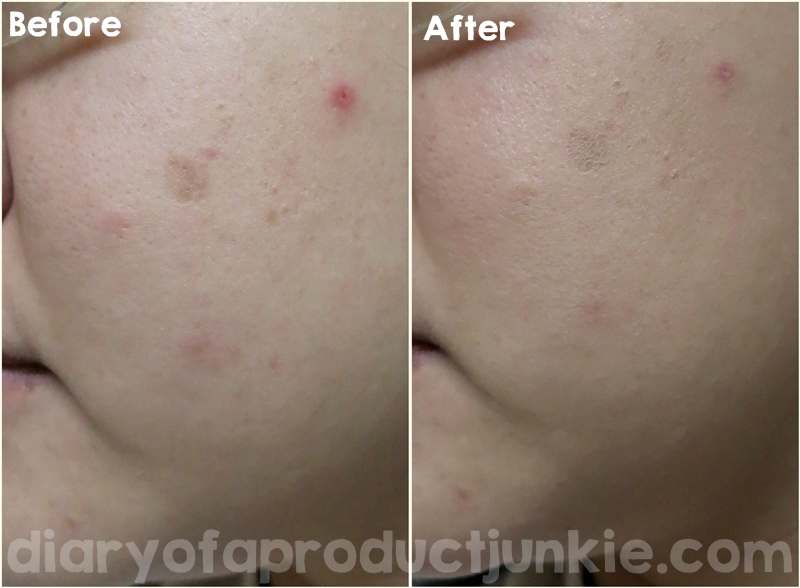 It gave me small acne on my cheeks, but nothing too severe. I do like the texture that makes it easy to blend the concealer and the smooth finish on the skin. Refer to the table below for more pros and cons. Nice info, ce phanie. So it only offers medium coverage. 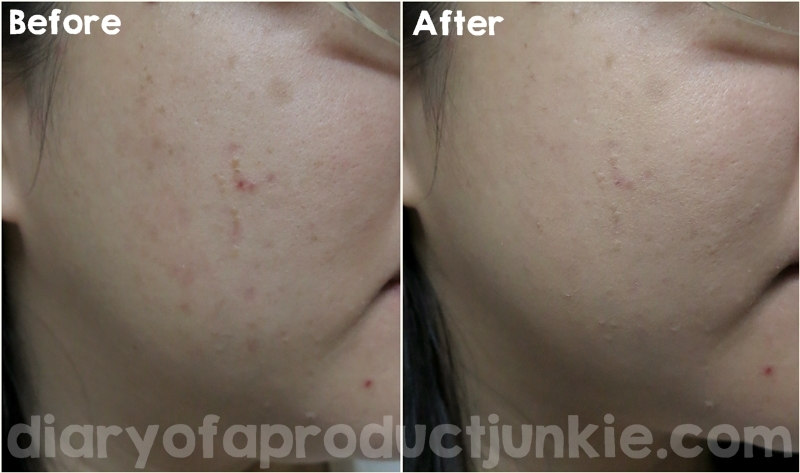 waaa penasaran sama concealer ini, di ingredientnya ada salicylic acid itu apa bisa nge-heal jerawat juga ce? bisa buat under eye ga ce?